This is one of those movies based on real life events that we often take for granted. AM Radio was king in the early 1960's. With fast paced DJ's rapping between songs and commercials often done by the DJ's themselves there was something more intimate about radio back then. But as the Nation changed so did the expectations of the average listener. They wanted something more relevant to what was happening in the community. At Radio Station WOL- 1460 AM in Washington D.C. this was apparent in the falling ratings. Into this vacumn comes former Inmate Petey Greene. A chance meeting with the Program Director of WOL during the latters' visit to a relative in prison leads Greene to believe that he has a job waiting for him at WOL when he gets out. He has been doing "broadcasts" inside the Correctional Facility and fancies himself to be a top notch DJ. When he is released after a very comical situation he heads straight back to D.C. and his old girlfriend (played by Taraji P. Henson and you gotta love her in this role!) Together they invade WOL to claim His job. promises,and then manages to deliver,the job as DJ. The repurcussions of this dramatic change are worth seeing. The lead DJ at the station, "The Hawk",is played with great effect by Cedric the Entertainer. His story could provide a whole other movie! And his potrayal of the "Nighthawk" is right on the money. He has issues with the new DJ that ultimatley get worked out to everyones satisfaction. With the racial divisions of the 1960's as a backdrop and the Assassination of Martin Luther King, Greene rises quickly to fame. He is changing the way radio is done. He is the precursor to Richard Pryor, Howard Stern, even George Carlin. But the forces of commercialism and profit propel Greene on a stairway to stardom that he neither wants nor is looking for. It all comes apart when he appears, unwillingly, on The Tonite Show and realizes that he has nothing to say to white America. So he fades away at the height of his popularity. But he left his mark forever on the media in the form of the freedoms we take for granted today. 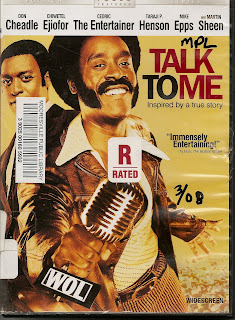 The movie is very fast paced and with a tremendous soundtrack of Motown and Soul Music this movie is worth the time. First released in 2004 I don't know how I missed this one!